I bought this tv for $25 @ a thrift store about 2 years ago. One of my best pieces of property I have until it started messing up recently. It started losing its color changing to red, green, and purple screen. It now looks like a tide eye shirt. I have the adevent Q2035A tv. Since I have had this tv it has been nothing but good to me and my family. I have had it alittle over a year and it hasnt given me any problems at all. This tv is great for a bedroom or office. tv in the store and that is why I got it. Impulse purchase of the Advent Q2035A turned out bad. My wife and I just moved into a new a house and needed a tv for our bedroom. Bought this POS. It lasted about 2 years but we had all the problems mentioned previously; loud buzzing from the beginning; blue screen issues; and finally today it just went blank. We recently had FIOS installed and the pictured worked for 30 days then simply went blank. Pushed the TV/AV button and it completely shut down. I unplugged/plugged it in and the TV never came back on. It even turned itself on and off twice. Didn't bother with any customer service call due to the other reviews. It's now a large paper weight/dust collector. I've never had such a terrible experience with any other audio/visual product before. I will never purchase an Advent or recommend it to any of my friends or enemies, for that matter. DO NOT BUY ONE or YOU'LL BE SORRY! The first couple of years this television was just fine for the bedroom. Clear picture, easily adjustable brightness for lights-out watching. But several months ago we noticed that the volume would take a few minutes to work. Now, it takes about 20 minutes to warm up enough for the volume work. As of this week, my wife believes it may be getting closer to half of an hour. So, the story goes, "cheap is as cheap gets". I have a Advent 32 inch flat screen TV that has been one of the best TV's I've ever owned. While I did not have HD service from Comcast I always appreicated the quality of the picture on the TV. I have never had a problem with the set save having to move it because it is so heavy, 65lbs! Other than that it has worked flawlessly from day one. I have no idea why anyone would complain about the Advent product. I realize there will always be times when one piece of equipment fails when another doesn't but I'll never complain about the one I have. Maybe those that bought the 27 inch TV should have gone with the 32 inch! It's not worth it! Even at the low price! I agree with the previous posts. My 27" Advent lasted about a year before I noticed problems. It first started out as taking a few moments for the picture to come through. Then it began to slowly deteriorate to a point where the picture would come in, but the colors were off and only after about 1/2 hour of "warm up time" the picture would finally come through. After 2 years of owning the set, the standard definition channels totally crapped out and no longer work and I only get HD channels (and that's only after about a 1/2 hour of "warm up time"). I feel like it's only a matter of time before they crap out as well. I think next time, I'd go with another brand. I mean, c'mon! I know I bought an HDTV for cheap, but only a year without problems is rediculous! Good picture but what does it matter if you pay hundreds of dollars for 10 months worth of viewing. Very very very poor quality and the customer service is even worse. Just like everyone else that bought this piece of crap TV, it worked fine for about 10 months and then the picture went out. I didn't even get the dreaded blue screen. The Tv just will not turn on. Press power and it makes noise like it's going to turn on and then it just shuts off. Advent is absolutely the worst brand of TV I've ever seen. If anybody is thinking about buying a TV, I recommmend spending the extra money and buying a brand worth paying for. Advent products are not good and their customer service is even worse. I too called and spoke to one of their reps who took my info and said someone would call me back. Well it's been six months since. Had I been holding my breath, I would have been dead a long time ago. What customer service?????????? Advent should not be on the market. None from Advent, thank God. Power button grew faulty after three years. I recieved the q2035a as a birthday gift in 2002 after my RCA 13" T.V. broke after two or so years of use. I love the image quality I get from the T.V. and the side video and audio in ports have been useful in many cases. I noticed all the reviews for this T.V. has been low and with complaints about getting a "Blue Screen of Death" but that has never happened to me. I'm a part of the military now and when I got my car from home I grabbed my Advent T.V. as well. With all the moving I've done in just the past two years, this T.V. has taken a lot of abuse and the only thing I have a problem with is on some occasions the power button on the TV itself does not work. 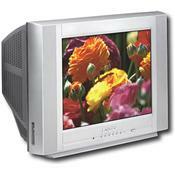 Purchased Advent 20 inch flat screen (model # (M2055A) and it worked great for about 10 months. Then the dreaded blue screen with no picture appeared. I have called Advent for the last 4 months with no help from customer service. The times I actually spoke to anyone at Advent I was told that someone would call me back. Each time I have called, my calls were not returned. I would not buy any Advent television at any price. This company just doesn't seem to care about customers. If you have allready purchased an Advent television you can save yourself a lot of time by just tossing it out when it stops working. Please don't take my word for it, but see other reviews on the Internet before you are even thinking about buying Advent products. Customer Service is the worst I have ever seen. RCA, Sylvania, Sony and Panasonic.